In this tutorial, you add push notifications to the Apache Cordova quickstart project so that a push notification is sent to the device every time a record is inserted. If you do not use the downloaded quickstart server project, you need the push notification extension package. For more information, see Work with the .NET back-end server SDK for Mobile Apps. This tutorial assumes that you have an Apache Cordova application that was developed with Visual Studio 2015. This device should run on Google Android Emulator, an Android device, a Windows device, or an iOS device. Watch a video showing steps in this section. In this section, you update code in your existing Mobile Apps back-end project to send a push notification every time a new item is added. This process is powered by the template feature of Azure Notification Hubs, which enables cross-platform pushes. The various clients are registered for push notifications using templates, and a single universal push can get to all client platforms. Choose one of the following procedures that matches your back-end project type—either .NET back end or Node.js back end. In Visual Studio, right-click the server project. Then select Manage NuGet Packages. Search for Microsoft.Azure.NotificationHubs, and then select Install. This process installs the Notification Hubs library for sending notifications from the back end. This process sends a template notification that contains the item.Text when a new item is inserted. If you haven't already done so, download the quickstart back-end project, or else use the online editor in the Azure portal. When you edit the file on your local computer, republish the server project. To ensure that your Apache Cordova app project is ready to handle push notifications, install the Cordova push plugin plus any platform-specific push services. Update the Cordova version in your project. To open the configuration designer, right-click config.xml. In the Cordova CLI text box, select 6.1.1. To update the project, select Build, and then select Build Solution. Apache Cordova applications do not natively handle device or network capabilities. These capabilities are provided by plugins that are published either on npm or on GitHub. The phonegap-plugin-push plugin handles network push notifications. In Solution Explorer, open the config.xml file. Next, select Plugins > Custom. Then select Git as the installation source. Enter https://github.com/phonegap/phonegap-plugin-push as the source. Select the arrow next to the installation source. In SENDER_ID, if you already have a numeric project ID for the Google Developer Console project, you can add it here. Otherwise, enter a placeholder value, such as 777777. If you are targeting Android, you can update this value in the config.xml file later. As of version 2.0.0, google-services.json needs to be installed in the root folder of your project to configure the sender ID. For more information, see the installation documentation. The push plugin is now installed. Follow the same procedure you used to install the push plugin. Add the Device plugin from the Core plugins list. (To find it, select Plugins > Core.) You need this plugin to obtain the platform name. Initially, we include some minimal code for Android. Later you can modify the app to run on iOS or Windows 10. This example shows calling registerForPushNotifications after authentication succeeds. You can call registerForPushNotifications() as often as is required. (Android) In the preceding code, replace Your_Project_ID with the numeric project ID for your app from the Google Developer Console. Complete this section to enable push notifications for Android. 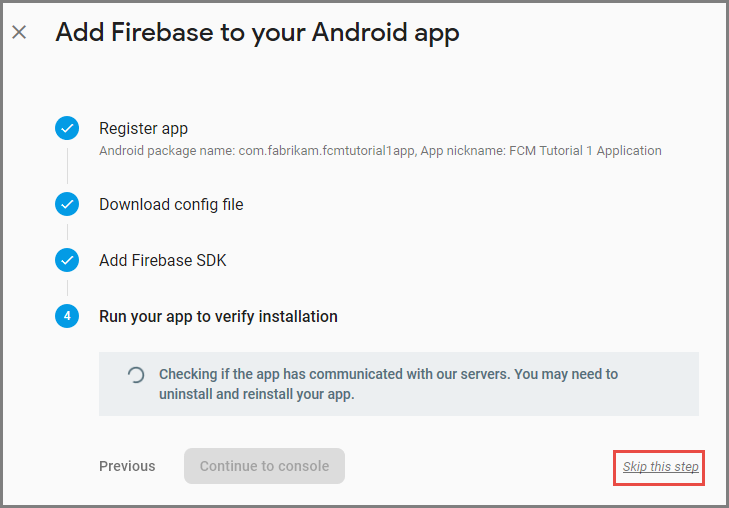 Since you are targeting the Google Android platform initially, you must enable Firebase Cloud Messaging. Under Settings, select Push. Then select Configure push notification services. Go to Google (GCM). Enter the FCM legacy server key that you obtained from the Firebase console, and then select Save. 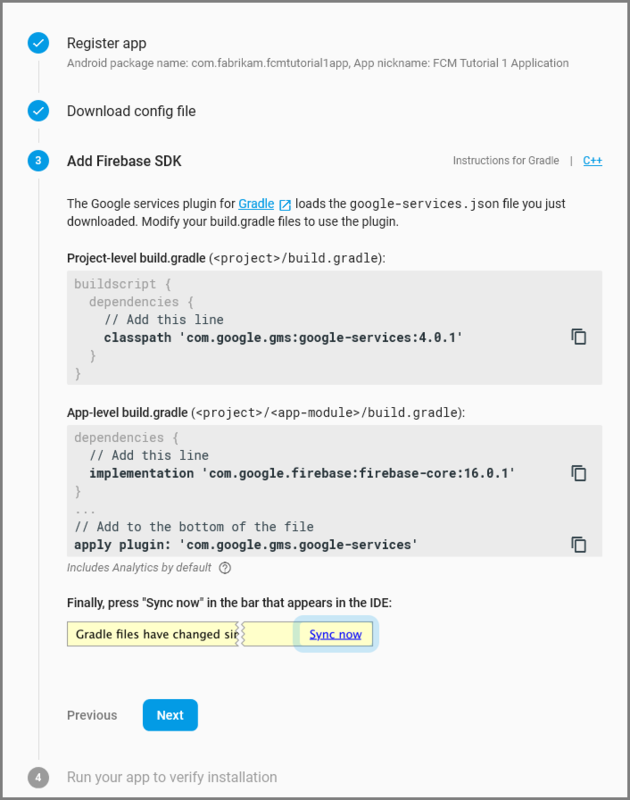 Your service is now configured to work with Firebase Cloud Messaging. In your Cordova app, open config.xml. Then replace Your_Project_ID with the numeric project ID for your app from the Google Developer Console. Open index.js. Then update the code to use your numeric project ID. Go to Settings > About phone. Then tap the Build number until developer mode is enabled (about seven times). Back in Settings > Developer Options, enable USB debugging. Then connect your Android phone to your development PC with a USB cable. We tested this using a Google Nexus 5X device running Android 6.0 (Marshmallow). However, the techniques are common across any modern Android release. The push plugin relies on Android Google Play Services for push notifications. Select Install Packages. Then wait for the installation to finish. The current required libraries are listed in the phonegap-plugin-push installation documentation. On a physical device: Attach your Android device to your development computer with a USB cable. Instead of Google Android Emulator, select Device. Visual Studio deploys the application to the device and runs the application. You can then interact with the application on the device. Screen-sharing applications such as Mobizen can assist you in developing Android applications. Mobizen projects your Android screen to a web browser on your PC. 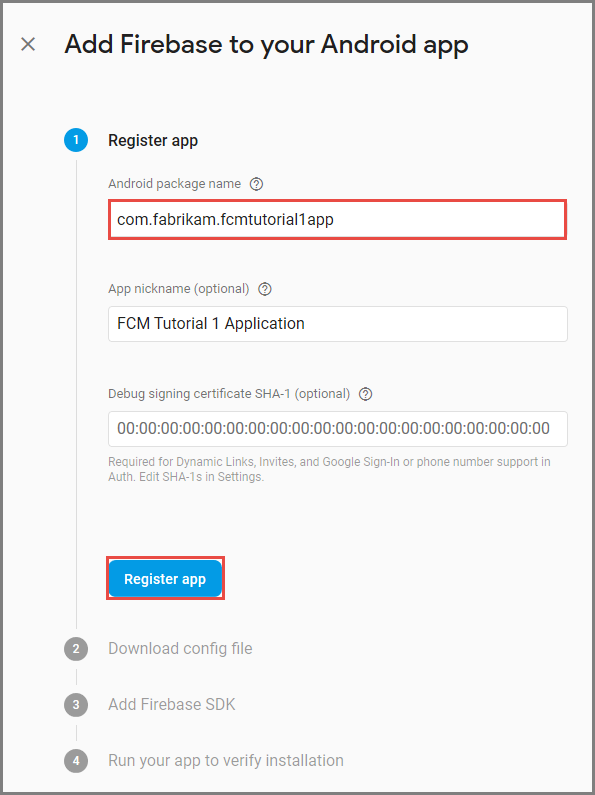 On an Android emulator: There are additional configuration steps that are required when you're using an emulator. Make sure you are deploying to a virtual device that has Google APIs set as the target, as shown in the Android Virtual Device (AVD) manager. If you want to use a faster x86 emulator, install the HAXM driver, and then configure the emulator to use it. Add a Google account to the Android device by selecting Apps > Settings > Add account. Then follow the prompts. Run the todolist app as before and insert a new todo item. This time, a notification icon is displayed in the notification area. You can open the notification drawer to view the full text of the notification. This section is for running the Cordova project on iOS devices. If you aren't working with iOS devices, you can skip this section. Before you can run a Cordova app on iOS using Visual Studio, go through the steps in the iOS setup guide to install and run the remote build agent. Make sure you can build the app for iOS. The steps in the setup guide are required for building the app for iOS from Visual Studio. If you do not have a Mac, you can build for iOS by using the remote build agent on a service like MacInCloud. For more information, see Run your iOS app in the cloud. Xcode 7 or greater is required to use the push plugin on iOS. Before you register your app for push notifications, open config.xml in your Cordova app, find the id attribute value in the widget element, and then copy it for later use. In the following XML, the ID is io.cordova.myapp7777777. Later, use this identifier when you create an App ID on Apple's developer portal. 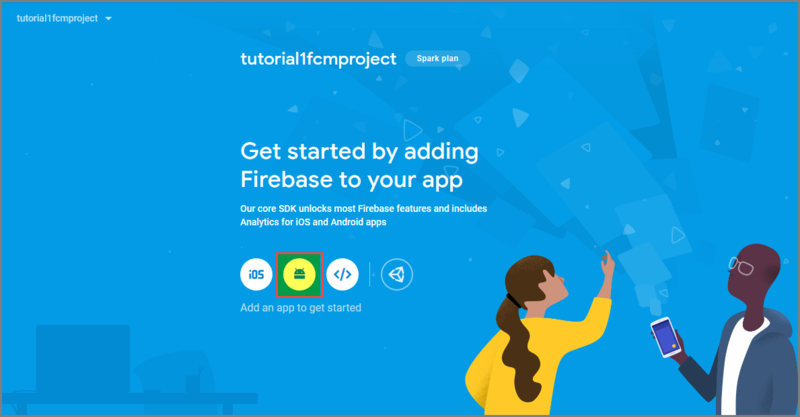 If you create a different App ID on the developer portal, you must take a few extra steps later in this tutorial. The ID in the widget element must match the App ID on the developer portal. Delete the platforms folder from your project. Delete the plugins folder from your project. Delete the node_modules folder from your project. Update the id attribute of the widget element in the config.xml file to use the app ID that you created in your Apple developer account. 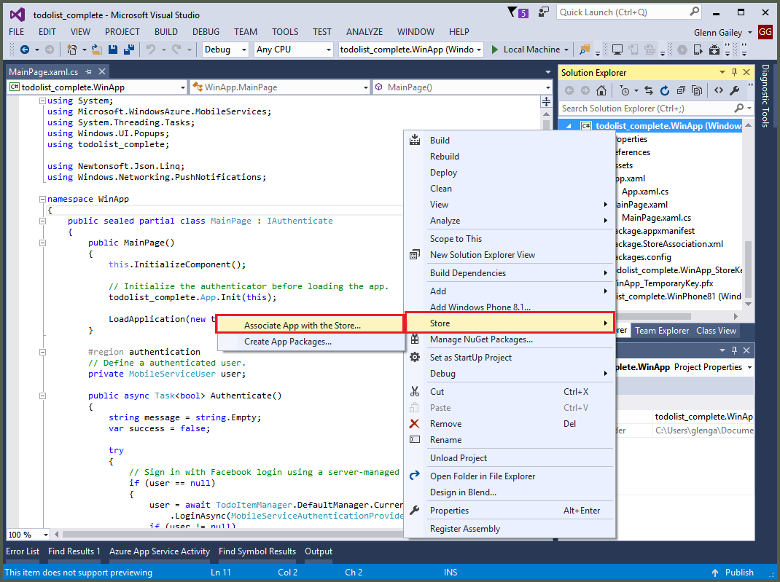 In Visual Studio, make sure that iOS is selected as the deployment target. Then select Device to run the push notifications on your connected iOS device. You can run the push notifications on an iOS device that's connected to your PC with iTunes. The iOS Simulator does not support push notifications. Select the Run button or F5 in Visual Studio to build the project and start the app in an iOS device. Then select OK to accept push notifications. The app requests confirmation for push notifications during the first run. In the app, type a task, and then select the plus (+) icon. Verify that a notification was received. Then select OK to dismiss the notification. This section describes how to run the Apache Cordova app project on Windows 10 devices (the PhoneGap push plugin is supported on Windows 10). If you are not working with Windows devices, you can skip this section. In Visual Studio Solution Explorer, right-click the Windows Store app project. Then select Store > Associate App with the Store. In the wizard, select Next. Then sign in with your Microsoft account. In Reserve a new app name, type a name for your app, and then select Reserve. After the app registration is successfully created, select the new app name. Select Next, and then select Associate. This process adds the required Windows Store registration information to the application manifest. 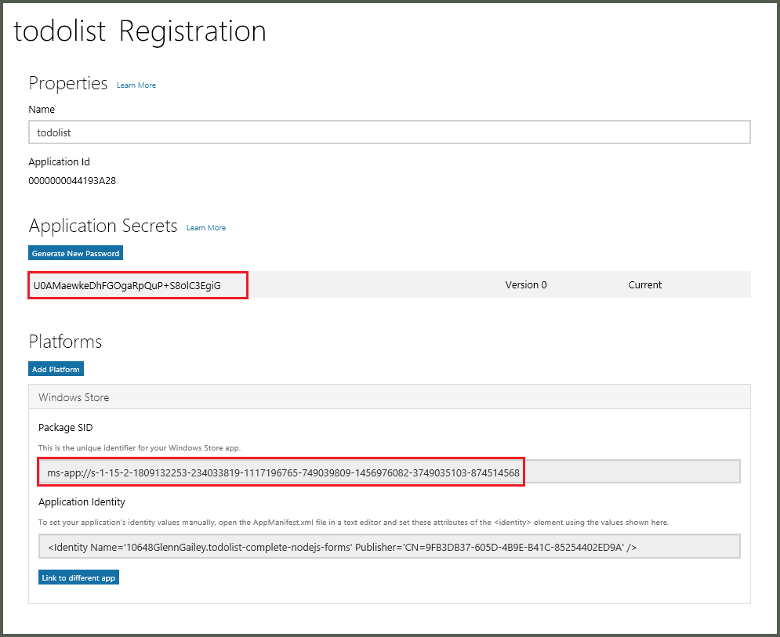 Repeat steps 1 and 3 for the Windows Phone Store app project by using the same registration you previously created for the Windows Store app. Go to the Windows Dev Center, and then sign in with your Microsoft account. In My apps, select the new app registration. Then expand Services > Push notifications. 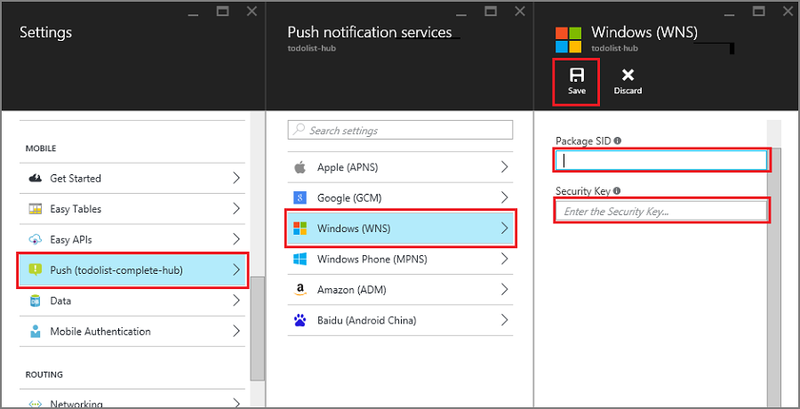 On the Push notifications page, under Windows Push Notification Services (WNS) and Microsoft Azure Mobile Apps, select Live Services site. Make a note of the values of the Package SID and the current value in Application Secret. The application secret and package SID are important security credentials. Don't share these values with anyone or distribute them with your app. In the Azure portal, select Browse All > App Services. Then select your Mobile Apps back end. Under Settings, select App Service Push. Then select your notification hub name. Go to Windows (WNS). Then enter the Security key (client secret) and Package SID that you obtained from the Live Services site. Next, select Save. Your back end is now configured to use WNS to send push notifications. Open the configuration designer by right-clicking config.xml. Then select View Designer. Next, select the Windows tab, and then select Windows 10 under Windows Target Version. To support push notifications in your default (debug) builds, open the build.json file. Then copy the "release" configuration to your debug configuration. Build the app and verify that you have no errors. Your client app should now register for the notifications from the Mobile Apps back end. Repeat this section for every Windows project in your solution. In Visual Studio, make sure that a Windows platform is selected as the deployment target, such as Windows-x64 or Windows-x86. To run the app on a Windows 10 PC that's hosting Visual Studio, choose Local Machine. Select the Run button to build the project and start the app. In the app, type a name for a new todoitem, and then select the plus (+) icon to add it. Verify that a notification is received when the item is added. 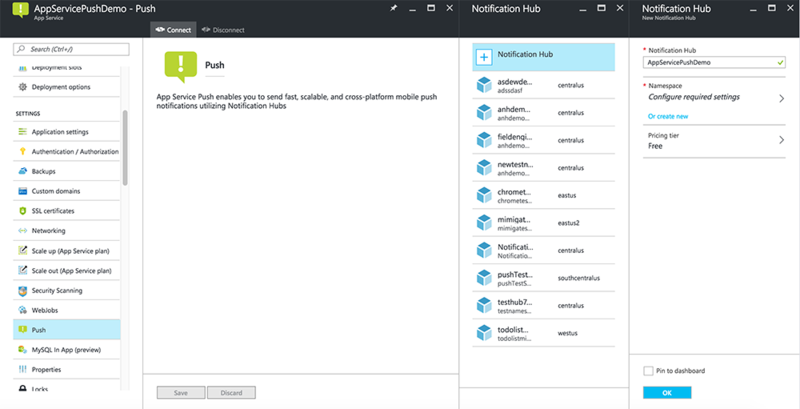 Read about Notification Hubs to learn about push notifications. If you have not already done so, continue the tutorial by adding authentication to your Apache Cordova app.